The objective of Alpha Dot is to analyze data from the Keck Telescope in Hawaii to accurately measure variations in absorption lines of PHL957, a QSO. For our purposes, older photons lead to a larger change in alpha and the greater the photon count, the smaller the error. Since the universe is expanding, the redshift of a cosmic light source relates to how far away it is. The further away it is, the older the "snapshot" we receive. The high redshift of QSOs tells us that the light we observe from them today was actually emitted a very long time ago. 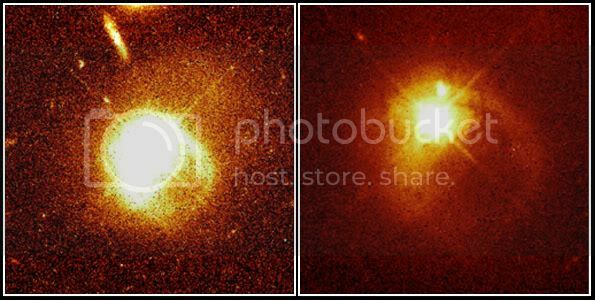 The most luminous objects in the universe are quasars (i.e. lots of photons). On average, the combined luminosity of a galaxy (approx. 1012 stars) is dwarfed by the amount of light emitted from a single QSO. The high number of photons emitted and old age of QSOs make them the perfect light sources for Alpha Dot. Telescopes today take pictures of the universe much the same way a digital camera captures a photo of your vacation. Within both are charged coupled devices, CCDs, which simply count the number of photons that enter the aperture. HIRES fits over 25 million 15 micrometer pixels onto its CCD1. 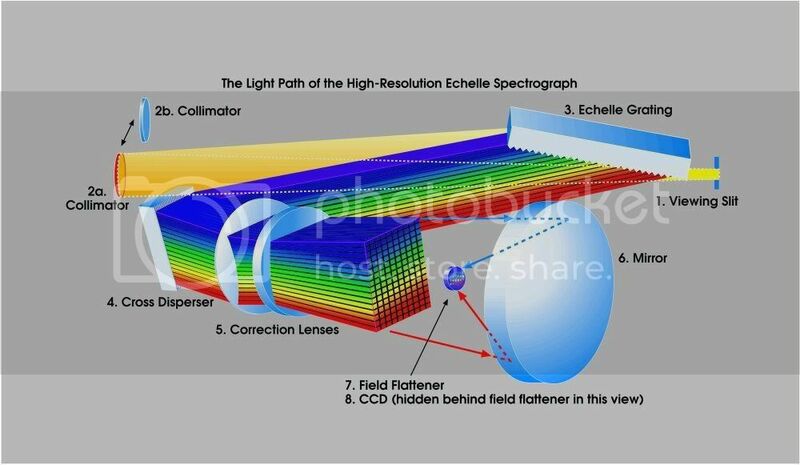 Before the light reaches the CCD it is split by the echelle grating to differentiate wavelengths into echelle orders much like a prism separates visible light. To calibrate the measurements, a cell of gas is placed in the telescope's line of sight in order to use these absorption lines as calibration markers2. This experiment utilizes Iodine's large number of absorption lines to increase the calibration accuracy compared to the Thorium-Argon used by Murphy et. al. 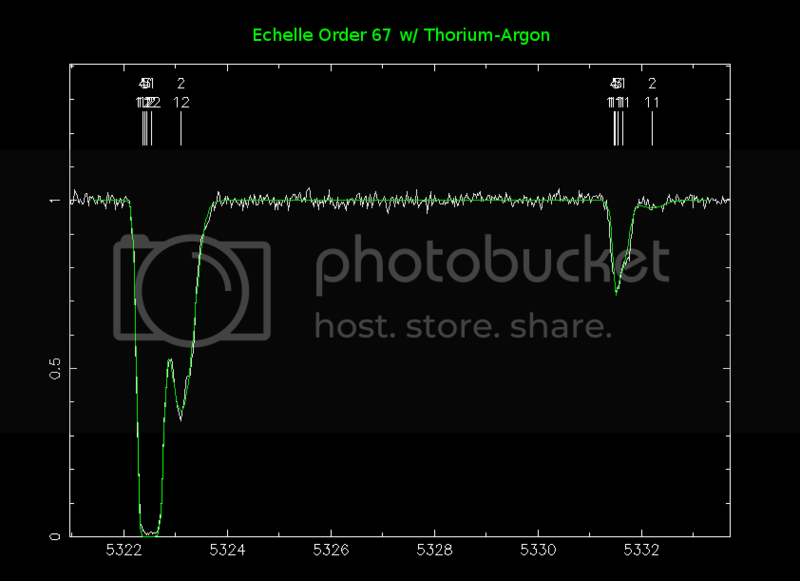 This is the result of fitting a voigt profile from VPFIT for the 67th echelle order with Thorium-Argon as the calibrating gas. The x and y axes represent the normalized flux of photons and wavelength in angstroms respectively. To accurately measure the absorption lines we use a program called VPFIT. Since the light travels through a gas, the temperature as well as density can effect the shape of the absorption lines. The aforementioned absorption lines discussion neglected these two complications up until now. The thermal motion of the gas particles can add to or subtract from the required energy for an atomic transition. Particles moving toward or away from the QSO allows more wavelengths to absorb. This process of thermal broadening is associated with a Gaussian distribution. The density and the temperature determine the rate of gas particle collisions. Like the thermal motion, the pressure of the gas affects the energy of individual particles. The broadening due to pressure is associated with a Lorentzian distribution. A voigt profile is the combination of these two broadening functions. VPFIT finds a fit by performing a convolution on a Lorentzian and a Gaussian distribution to match the absorption line.